In the black recesses of deep space, a lone ship undocks, piloted not by a living player but by a script-driven bot. The veteran capsuleer may not be shocked by such a scene – it’s something we’ve been hearing about a lot lately. Other players in games like PlayerUnknown’s Battlegrounds are already familiar with the presence of aimbots, wallhacks, and other FPS hacker staples. But this ship is undocking in the galaxy of Elite Dangerous. According to information gathered by the Alliance Office of Statistics, Powerplay supporters of Edmund Mahon have been under near-constant attack by automated fifth columnists since at least September of 2017, and for an unknown period of time before that. The evidence? A compelling video showing six separate pilots following identical – and bizarre – flight behaviors while carrying Powerplay and mission-related cargo, a response from FDev that temporarily slowed the problem, and a pattern of influence on the background simulator that most human-populated organizations could only dream to maintain. 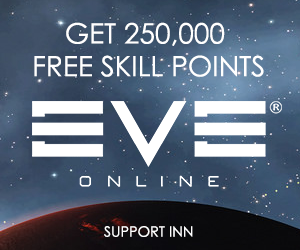 It’s a strong case that raises questions about botting in Elite – and whether there’s anything Frontier can do about it. With the 1.3 patch in 2015, Frontier introduced the “Powerplay” mechanic. 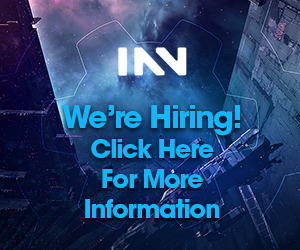 In Powerplay, players choose to support one of ten (now eleven) NPC “powers,” characters with considerable influence in the galaxy, then complete tasks to expand their influence over the systems in space. Most tasks involve hauling cargo, with some powers having an option to engage in special kinds of fights similar to conflict zones. Anyone pledged to a power has access to ten units of the special cargo per hour, but with the option to buy more. Players steer the power’s expansion or collapse with their labor, working individually but in aggregate to support systems that will expand control, while working to let go of systems that cost more to keep than they bring in. Because anyone can pledge to any power, and because the voting is open to anyone willing to do the work, one of the most popular methods for expanding your power, or collapsing your neighbors’, is the venerable “fifth column.” By joining an opposing power in large numbers, it’s possible to expand them in undesirable ways and into systems that ultimately hurt their control, resulting in losses rather than gains. This mechanic is difficult to counter without an organized core of players to oppose such an organised attack – harder still when the saboteurs are bots. In addition to Powerplay, Elite’s organizational-level play often focuses on the background simulator, an influence and percentile game that also makes Powerplay easier or harder in any given system based on what government type is in control. Suspected bots also targeted the background simulator, both as a way to raise money to fund accelerated powerplay activities, and because directly transferring wealth between players is impossible in Elite, to get into bigger ships. The Alliance Office of Statistics is one of the coordinating organizations supporting the Powerplay ambitions of the Alliance NPC Edmund Mahon. They first began to suspect some of their opposition might not have been manually piloted after multiple encounters in Open. The enemy pilots, with obnoxious ‘meme-y’ names like “Choosen of kek,” “#NotAllOrcs,” and “ÖööööÖ” were seen repeatedly, throughout the day, flying ships named, for example, “I Prep Soholia” or “Soholia for Mahon.” These ship names, Alliance representatives assert, are clearly meant to either needle and demoralize observers who can see the obvious fifth column in action, or to encourage clueless pilots to prep Soholia: a terrible system which cost Mahon influence every week that it was under his control. But a fifth column isn’t necessarily botters – in fact, as far as anyone can tell, this has never been done before. Given the unusual nature of Elite’s multiplayer content, due to solo and private game modes, it difficult to know with any certainty, but nobody has reported this kind of botting publicly until now. So what evidence is there? A lot of clues have come together to support the conclusion. Multiple ships were flying the exact same bizarre fits, executing the exact same bizarre flight patterns, carrying the same kind of cargo from taking the same kinds of missions, all day, every day, for weeks on end. At first, it was just sighting the same pilots in systems at the same times. These kinds of random bump-ins aren’t unheard of, but given the vastness of Elite’s galaxy, and the difficulty of instancing with other players in even the best circumstances, seeing the same pilots in the same system day after day certainly leaves a mark, and the names weren’t exactly forgettable. The “departure anomaly” here refers to a specific flight pattern seen in the bots. According to the Reddit thread, the script goes like this: “Take off from pad, take roughly 30 seconds to fly vertically upwards from the pad, align with the airlock and fly out at <100ms with gear down. Maintain heading to directly out of the airlock to roughly 10km, clear of the station mass lock and come to a complete stop, then align with the destination system. Raise gear, charge FSD while stationary. Full throttle and jump.” It’s clearly visible in this video, which shows the first six accounts to have been banned. Beyond that, the bots were difficult to nail down. They could only be scanned while docked in a station, presumably while gathering Powerplay cargo to haul or cycling mission boards for money and BGS influence. Scanning the ships any other time would cause them to immediately combat log – killing the game process, which instantly removes the logger from the multiplayer instance. For a bot, this is a reasonable survival mechanism; any time an adverse event occurs – interdiction, scanning, whatever – combat logging guarantees a safe outcome. The bot can do this so quickly it guarantees safety. Cycling to another game mode, whatever threat would be gone, allowing the bot to continue its script. Sophisticated, but not impossible. Following reports from multiple players, the first six accounts were finally banned, but only for thirty days. After the thirty day bans expired, four of the bots returned, with eleven new ones as well. Frontier often runs deep sales with the base game as low as $15, and happened to have just such a sale during the bans. 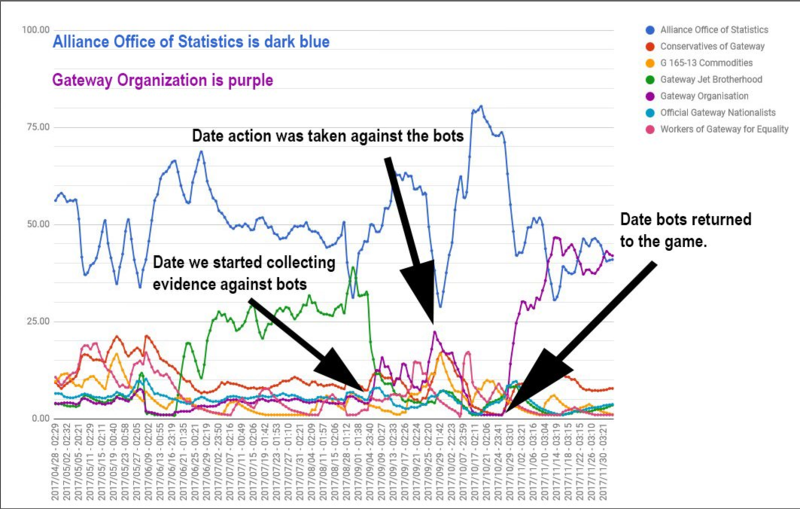 Whereas the influences on the background simulator had stabilized once the bots left (graph), they once again were facing an adversary able to hit the influence cap consistently, every single day, and without facing burnout (graph). Alliance Office of Statistics graphic shows changes in influences before, during, and after the first bots were banned. After facing a ban, the bots had also become slightly more clever. The bots were often seen flying in Open Play, either as a way of demoralizing Mahon’s supporters or as a way of confusing clueless casuals. But after the bans, they rarely ever undocked in Open Play, only appearing to cycle the mission board. Now, perhaps motivated by revenge, they seemed more focused on impacting the background simulator as well. Because the bots were no longer undocking in Open Play, new methods had to be used to track their movements. Fortunately, using third-party tools that tap into Elite’s event logs for information, player movements could be tracked from market to market. This worked well, until updates to the third-party tools removed player account names from the available information. Then, the bots could only be tracked by the transactions themselves, and by the damage to system influences they left in their wake. 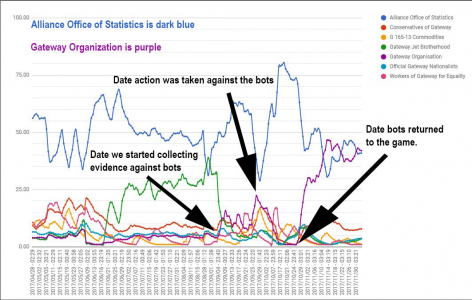 After months of grinding desperately against the bot army, the Alliance Office of Statistics had nearly exhausted its resources. Playing with the background simulator is a tedious chore at its best, made rewarding only by the sweet taste of success. Fighting a losing battle against an enemy that never sleeps and can’t be stopped is terrible. Finally, for the second time, Frontier took action – but only after AOS threatened to go public with the issue. Predictably, with all 15 bots banned, AOS’ systems rebounded quickly, surging by as much as 40% in a few days. Unfortunately, it was yet another 30 day ban. After the 30 days, the bots came back yet again. This time, they were focused even more so on the BGS. The only way to stop or pause them was to force wars in the systems they targeted. Because the bots cannot fight in conflict zones, they would only influence systems to trigger elections – a mechanic for system control change that only requires the players to run missions as usual, something the bots excel at. Not only that, but for the first time a new kind of bot appeared. Termed “baby bots,” these bots flew cheap T6 cargo ships, rather than expensive Anacondas and Cutters. Presumably running these missions to build their way back up, even more bots had entered the field. Now, just a few months after the last waves of bans, AOS was forced to go public on Reddit with this information due to Frontier’s lack of response. In the thread, they’ve asked Frontier to stop selling the game at deep discounts. Hopefully, the reasoning goes, the botters won’t want to pay for new accounts at list price. But this wouldn’t solve the real problems identified here: how should Frontier deal with automation in a game that only contacts centralized servers in passing? When the multiplayer activity is all peer to peer, how do you police player inputs? If the game were single-player, this wouldn’t matter. Scripting and botting would be merely convenience tools for players who want to see far removed parts of the galaxy but don’t want to spend the hours it would take playing the celestial equivalent of Desert Bus. But Elite is something like a multiplayer game, which means that such tools can be used to gain an unfair advantage over other players. With Solo and Private game modes eliminating the risk of ever being seen by another player, bots are nearly undetectable. Even these bots, which had obvious and real effects on the game for hundreds of players, were only discovered by their flying in Open. A 30-day ban is an ineffective solution, and routine deep discounts on new accounts may encourage the use of botting alts, which quickly turns Elite into a Pay-to-Win exercise: your power to influence the BGS is as strong as the number of botting accounts you can afford to run. Unless Frontier takes action, as scripts become more sophisticated and more widely available, this kind of activity will only become more common. The visceral experience of playing Elite remains top of its genre, but the odious task of accomplishing background simulator or powerplay goals remains a tedious grind. If this grind can be replaced by automation, it’s only a matter of time before BGS organizations and trolls who want to see it all burn alike begin using it. Without swift action from Frontier, the greatest threat to Elite’s galaxy may not be Thargoids at all, but rather a Botter Apocalypse. Thank you for this write-up, Para. After having a front-row seat to your efforts to influence the background simulation when leading the Diamond Frogs, I can only imagine what it must be like to see this brazen cheating – seriously, they only got called out because they flew in public. It makes me wonder what can be done to detect other such activity on private and solo instances. I don’t think that stopping discounted sales is the way to stop cheating (certainly that’s how I get into a lot of new titles), but I agree that this is an issue that needs addressing. Excellent article. Very interesting game design problem. Thanks for the summary. Bots can completely destroy an MMO and devastate the player economy. Asheron’s Call was pretty much killed by bots and an indifference by the devs towards the damage bots were doing to their game. Yeah, botting can ruin any MMO, and proactive dev response is absolutely necessary. CCP isn’t flawless but at least there is an effort being made. The real struggle for Frontier here is that conscious design decisions in Elite, including a client-side P2P galaxy model, makes it so that the bots don’t even face _NPC_ threats, let alone threats from other players. The ability to have the script kill a client and log back in, and the fact that Solo does not persist, means that any act of aggression can be avoided by the bot by simply relogging. It’s a thing players have complained about since launch, and it’s so core to the design of the game that I’m not sure what Frontier can do about it except enter into the 3rd party app detection arms race. Even that is hard to do, because unlike Eve, where players can blow up and report botters, in Elite, players never know botters exist unless they log into open like they did in this case. thank god they are doing nothing and not even admitting the problem is there, we now have group bot blockading Lave to prevent people from unlocking didi viterman, if you cannot buy brandy, you cannot unlock her, and since their bots keep the system in lockdown…. i just keep hoping somehow they will endup changing the faction in control in such a way that it makes alcohol illegal, brandy included, so that fdev can answer tickets about why its impossible to unlock her, because the commodity dosnt exist anymore. would make the vets doing this very happy since they would be among the elite of elite who have g5 booster access!!!!! Something I hadn’t looked into, but makes sense given the noteable bandwidth changes in a populated system. Is it true that player interacts are peer-to-peer?